Cocker Spaniel Resources, Inc (hereafter called CSR) was founded to help as many Cockers as it possibly could. During the first years of CSR it became apparent that society was discarding Cocker spaniels which were old or had significant health issues. The board decided to set aside money for “older,” “senior,” or disabled Cocker Spaniels. Not only did the board decide to fund their care but each Golden Aged Cocker needed to have a loving, caring home to live in for the remainder of its days. The program has evolved over the years and has expanded to covering more of the expenses which come along with disabilities and the aging process. This is a great program for families with limited income or seniors who want an animal but not a puppy. CSR takes care of the yearly (age appropriate) vaccinations, four grooms per year, and heartworm prevention. CSR also takes care of most major surgeries which may be needed for a Cocker tom maintain an acceptable quality of life. Most of the surgeries necessary are the ear ablation a common problem with chronic ear infections in Cockers. 7 Cockers which entered Golden Age Cocker Retirement were ages 12 to 14 years. 5 Cockers were adopted by their Retirement Families. The application for one of the Golden Age Cockers is the same as an adoption for a younger cocker. The only difference is the actual adoption contract. The contract is called Retirement Contract. To find adoption forms and applications please visit our resources page. 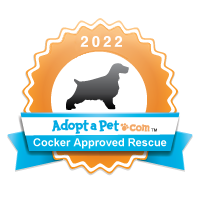 To find out what Cocker Spaniels are currently available for adoption please visit us on facebook or contact us here.